Science Project _ Compare carpet stain removers for their effectiveness? 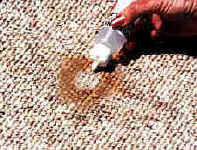 Compare carpet stain removers for their effectiveness? General purpose detergents may not be able to remove certain types of stains on clothing, carpet or any other fabric. Some stains produce a mechanical bind with the fiber of the fabric. Some other stains create a molecular bound. In either way, a more effective stain remover is needed to remove them. Almost all manufacturers of stain removers claim that their product is the best and is the most effective; however, that might not be the case for every type of stain. In this project you will perform experiments to compare different stain removers for their ability to remove stains.